Ships tomorrow if ordered in the next 1 day, 14 hours and 56 minutes! Contains catalase enzymes to help slow the greying of hair and support healthy, thicker hair. 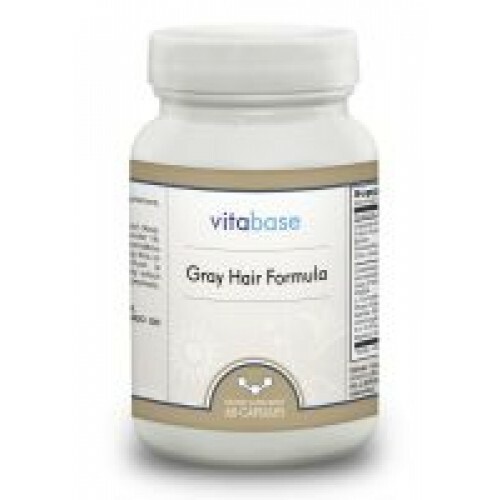 Vitabase Gray Hair Formula is based on the exciting new research released in Feb., 2009. Scientist have traced grey hair to the absense of catalase enzymes. Hydrogen peroxide is naturally found in the body, and is responsible for interfering with the pigment that colors skin and hair. The catalase enzyme is responsible for breaking down this hydrogen peroxide into water and oxygen. As we grow older, our body produces less of the catalase enzyme leaving nothing to transform the hydrogen peroxide into chemicals the body can release. As the hydrogen peroxide builds up - we grow gray. Vitabase Gray Hair combines catalase with other nutrients recognized for their benefits in promoting healthier, thicker hair. © 2011 Perfect Shape Limited. All Rights Reserved.